When Siri was introduced on the iPhone 4S back in October 2011, no one knew the people they were speaking to, yet they fast became some of the most recognised voices in the world. The only people who knew the voices speaking back at them were the voice actors themselves, and even they weren't certain at first. Apple didn't publicly reveal the names of the Siri voices, but the company also didn't see fit to contact the actors directly either - so it was a bit of a surprise when they discovered they were inside millions of phones. Jon Briggs (aka @voiceofsiri), the voice of Daniel the original UK male Siri, was one of those people. "I just happened to be watching BBC Breakfast and Rory Cellan-Jones, the BBC Technology Correspondent, comes on, he presses a button and I thought 'I recognise that voice'," he told us. Karen Jacobsen, the voice of the Australian female Siri, had an even more bizarre moment of discover. "The first I time I found out my voice was in phones was when my friend Patricia called me from California to tell me I was in her iPhone. "Initially it was quite bizarre to hear my voice coming out of GPS and smartphone devices. Now it is less of a surprise but it is still surreal. I mean, how unexpected and unusual to have my speaking voice in so many places around the world." Briggs and Jacobsen aren't the only original Siri voices to reveal their identity. Susan Bennett was the first to announce she was the voice of Siri in the US, where the character is named Samantha. Bennett told techradar, "I've not had any contact with Apple apart from meeting Steve Wozniak at a tech conference last year. He's an absolute genius, very interested in education and he's a super awesome guy. "It was fantastic meeting him – he acknowledged me as Siri. That's the closest Apple has gotten to acknowledging any of the Siri voices." "Apple has never been in touch" added Briggs, who is also well known as the voice of UK game show The Weakest Link. "But by the very virtue that I was only there for a very small amount of years, it obviously was not to their tastes." Apple replaced the voices of Siri in the iOS 7 update which was released in September 2013. Briggs is convinced the reason each voice has changed is because the actors revealed who they were. "They didn't want to have identified voices. You've got no idea who the new ones are. They would have signed such tight non-disclosure agreements that you will never, ever find out." Like all the other voices of Siri, Susan Bennett didn't sign up to be Apple's new voice activated assistant. 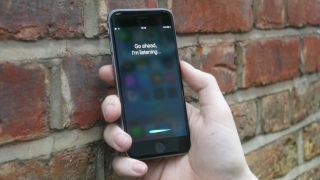 Apple used a technology it bought from a company called Scansoft (later renamed Nuance) where each of the voices of Siri had previously been recorded. "It was extremely tedious, four hours a day and five days a week, for the month of July 2005," said Bennett. "Those were the original recordings that became the basic vocabulary for Siri. There was a huge, huge list of phrases and sentences that were created solely to get all of the sound combinations in the English language. "So you can imagine it was a lot of nonsensical statements that were just utilising different syllables and putting the different sounds together. "Every sentence, every phrase has to be read the same. The same pacing, the same intonation, the same emphasis and the same pitch. It does get extremely tiresome." Karen Jacobsen said her recording process took almost 50 hours. "They only wanted me to record a maximum of four hours per day so my voice did not sound fatigued in any way. "I recorded about a phone book worth of script and sometimes repeated certain words up to 200 times. For example: 'approximately one hundred metres', 'approximately two hundred metres', 'approximately three hundred metres.' By the end the word 'approximately"' sounded very strange to say." You might think that being one of the most-heard voices would bring in the big bucks, but none of the voice actors were given any extra payment for being included in Apple's technology. Bennett said, "I think all the original voices of Siri felt a little bit ripped off. We were paid well for the initial work, as that type of work goes, but no one was ever paid for use. It was a little disturbing to find our voices on millions and millions of devices without compensation." Briggs was a little happier about the outcome. "The world's not all about money and I got paid well for the job I did originally. "Had we known where it was going we probably would have changed the fee structure somewhat. But hindsight is 20/20 vision, isn't it? "I don't think you can be annoyed about any of these things. When you record a system like that we had no idea where it was going to go and what it was going to be used for." But Briggs believes Apple could have handled the whole situation a bit better. "I think Apple probably, if they'd been sensible, should have gone to all the voices they were about to use and say 'Right guys, this is what's going to happen, and we'd like to make a little deal with you to use your voice going forward'. I think they were a bit dim on that score. "Apple is brilliant at technology but not very good at people." Briggs however seems open to the idea of recording for another OS, but thinks being the voice of Siri has actually hurt his career rather than help it. "I think actually it has denied me a couple of things. There were a couple of Microsoft jobs that might have come my way if I wasn't the voice of a competitor. I think it's worked against me, not for me." All the voices seem to enjoy being the voice of Siri in at least some capacity. Jacobsen especially, she said, "It is huge fun to be a part of pop culture. From the first time my voice was in GPS devices it has changed my life in so many ways. "Who could have imagined a little girl from a small town Mackay in Northern Australia would end up becoming such a well-known voice?" Bennett agrees, "Every time I hear myself as Siri it's weird. I'm very flattered out of all the voices recorded they chose mine." While voiceover work has had an unexpected outcome for Briggs. "The true definition of irony is I get these annoying phone calls at home. It's my own voice selling me PPI insurance for a PPI policy I don't have. You do tell yourself to 'eff off' sometimes."